Baby birds were sprouting like sunflowers all over the garden last week. Three young Carolina wrens worked their way through the shrubbery along the porch. Two newly fledged towhees played at kicking up leaves and dirt at the edge of the border. One, just like a wayward child, even backed into a planter and hid from his mother when she came looking for him. When she left, he came back out. The young crows have been joining their parents for several weeks. One youngster still talks his baby talk, begging for food. He knows how to pick up seeds and dunk bread in the birdbath, just like the adults. Still, he spouts his shrill baby cries. We watched, enthralled, one day while a young crow picked up a wet leaf from the bath and played with it. He tossed it around, laid it down and admired it, picked it up again, and then finally, tiring of the game, he just walked away and left it. The young downy woodpecker has been visiting the suet for a couple of weeks. He is not nearly as wary as his parents are and will feed while we sit on the porch and watch. One of the most comical was the red-bellied woodpecker taking his first flights a few days ago. His parents have a nest at the top of a lightening-struck pine tree. I watched them work away at building their home this past spring. This fella (or gal) was learning to fly and had not learned to be afraid of us two-legged creatures. We had carpenters working on our front porch when this fledgling woodpecker, still clothed in some baby plumage, flew through. He landed on a shutter next to the porch; he landed on the newly installed porch post; then he practiced by flying between all of us on the porch to the little dogwood out by the driveway. He would rest there a bit, then fly back through the porch and people, and thud onto a pine at the other side of the front yard. This required some good flying as he had to bank and maneuver through people, porch posts and railings. This went on for enough flights for me to get a photo. (The white flowers at the base of the picture are beautiful Limelight hydrangeas.) Then his mother swooped through and began calling him away toward the magnolia. Obviously, she taught him a good lesson about the dangers of getting too close to people. I hope to see him again one day. These birds are Eastern dwellers. Their red belly is not easy to see. The gray belly feathers over lap and hide the small streak of red. This makes them easy to misname. 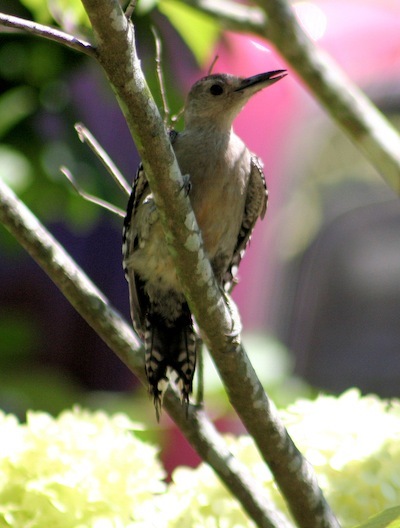 Red-bellied woodpeckers are often mistakenly called ladder-back woodpeckers since they have similar striped markings. Ladder-backs are smaller birds and found out West. Red-bellies are also sometimes referred to as redheaded woodpeckers because of their red top hats. Redheaded woodpeckers are not as plentiful as red-bellied. They have a full red head and neck and solid black plumage on their backs. Female red-bellied woodpeckers have red at the base of the back of their head, called the nape. The males have a red cap on top of their heads that extends down their nape. The male is the one I see taking mouthfuls of food to a tree trunk and packing it into and behind the bark. Then he brings his youngster to the tree and shows him how to search out insects. If you want to learn more about red-bellied woodpeckers, go to Cornell’s All About Birds website. Better yet, if you have a dead or dying tree that is not near buildings and does not threaten property or lives, leave it standing and you might entice a woodpecker family to move in.